Home » Chinese Horoscopes 2020 » Pig Horoscope 2020 – Free Astrology Predictions! Pig Horoscope 2020 – Free Astrology Predictions! Pig horoscope 2020 predicts that you will feel like you have more freedom this year. You will feel more productive in your daily life, and many different aspects of your life. You will feel more charismatic and friendly this year as well, which is sure to help with many scenarios of your life. Try to relax in your free time, and you will have a great 2020 year of the white metal rat. The last sign in the Chinese zodiac is the sign of the pig. While most people don’t think much of pigs, people who are born under the sign of the pigs have some pretty great personality traits. People who are born in the year of the pig are generally said to be kind, tasteful, snobbish, helpful, and great friends. All of these traits work together to build these people’s personalities, as well as how they deal with what their 2020 horoscope has to throw at them. 2020 Chinese horoscope for the pig predicts your love life will take a casual stance this year. If you are currently in a relationship, then you will be more relaxed with your partner. Things will run smoothly in your relationship, and you will have fewer arguments than usual. You may want to add some excitement with your partner from time to time. But, for the most part, your relationships will be stable and harmonious. This is a good year for the Chinese zodiac pig to get married or plan for a baby. If you are a single pig or boar, then you are likely to be happier in a casual, rather than a serious, relationship. Serial dating, hook-ups, and other relationships of the sort will make you happy. Just make sure that you are careful in these relationships. When it comes to your friends and family, you will feel like you need to time things more carefully. You may be tempted not to communicate with them at all, but that’s no good. Try to be formal when you talk to others, but don’t stress yourself over it. Marriage, children, and pregnancy need to be decided after some thought in this year of the rat. Board 2020 predictions suggest you are likely to feel more ambitious at work this year. You’ve got some good timing for this, as this is a great time for you to get a promotion. Make sure that you keep in touch with your co-workers and bosses; these relationships will help you to advance in your career. You may gain more authority in your job this year, which also means more responsibilities. Make sure to keep on your duties, and you are sure to succeed this year. Pig, you will also be lucky when it comes to your finances too. You may be tempted to waste your money on things that you don’t need like fashion or other things to improve your outer look. This has a chance of bringing you into debt. Only spend money that you know you have. This simple tip will save you a lot of trouble in this Chinese new year 2020. There will be some minor health annoyances in your life this year, but your 2020 pig Chinese horoscope doesn’t predict any major health problems. Try to strengthen your immune system by taking vitamins and having a balanced diet. Exercising and getting enough sleep can also help to improve your health. January 2020 is a month when you will be in a dilemma for most decisions of your life. February 2020 is when things will start improving, and you will have the proper frame of mind to do something constructive. March 2020 is a month for planning and more planning. This is not a good time to put any plan into action. April 2020 can come with its share of difficulties and questions. But if you resolve to overcome all the challenges, nothing should be complicated. May 2020 is the period when you will feel like you are losing out on everything in life. But that is not the case, and you will find out soon. June 2020 is a month of hard work, patience, and perseverance. You might not see the results immediately but have faith in yourself. July 2020 is a period when your diligence and enthusiasm will be at its peak. Just keep at whatever you put your mind to, and you should fulfill your dreams soon. August 2020 is a month when you will be eager to try out something new. It might be a new delicacy, an adventure, a new job or relocation to a new place. September 2020 is a month of stability and bliss. Everything will go according to your plans. October 2020 is not a month for social relationships. You should concentrate on your job and business for the moment. November 2020 is when you should be careful before trusting unknown people with confidential information. December 2020 is a month for fun and happiness. But remember not to go overboard and live beyond your means. 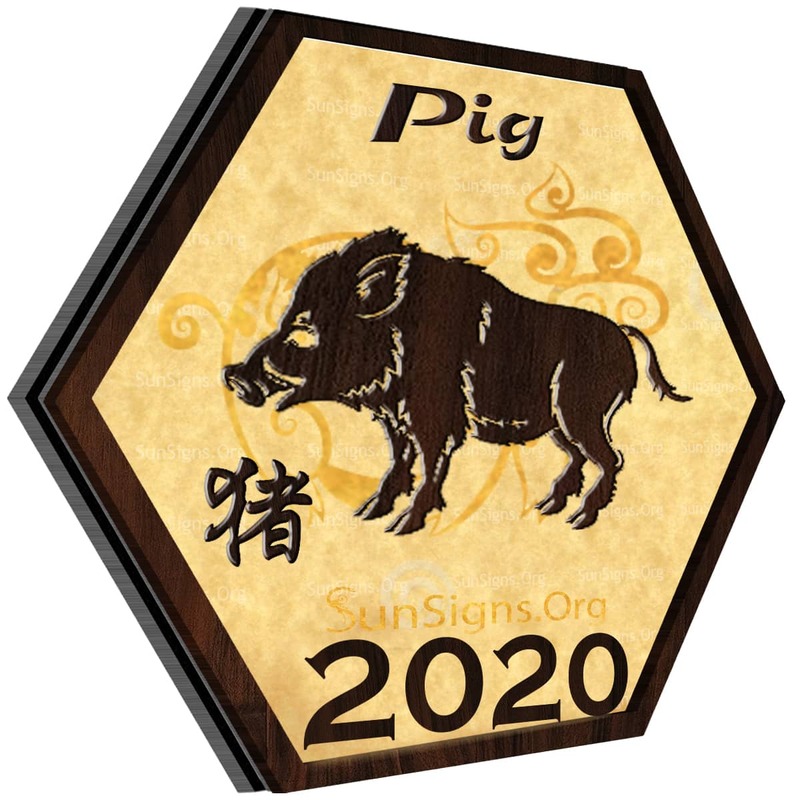 2020 yearly Feng Shui forecast for the Chinese pig sign predicts unexpected money. But you also should not let your sensitive personality affect your love relationships. This year you need to make changes in your life, the stars aren’t going to do it for you, even though they may bring many new opportunities to you. Take all of the opportunities that you can! This will do a great deal to change your life for the better. Pig horoscope 2020 asks you to work hard while you are actually on the job. But make sure to relax and spend time with the people who you love when you have some time off. If you do all of these things, then you will be sure to have a great 2020! Previous Dog Horoscope 2020 – Free Astrology Predictions!